Two characters, Del and Lee, search for a memorial to an act of violence that had an explosive cultural impact on their rapidly shifting city, a quest that finds them negotiating challenging physical and interpersonal landscapes. They share the stage with Clare, a vulnerable docent-like soul whose personal tales skirt the edges of Del and Lee’s search. At its core Vicinity/Memoryall investigates the power and purpose of memorials for individuals and the culture at large. 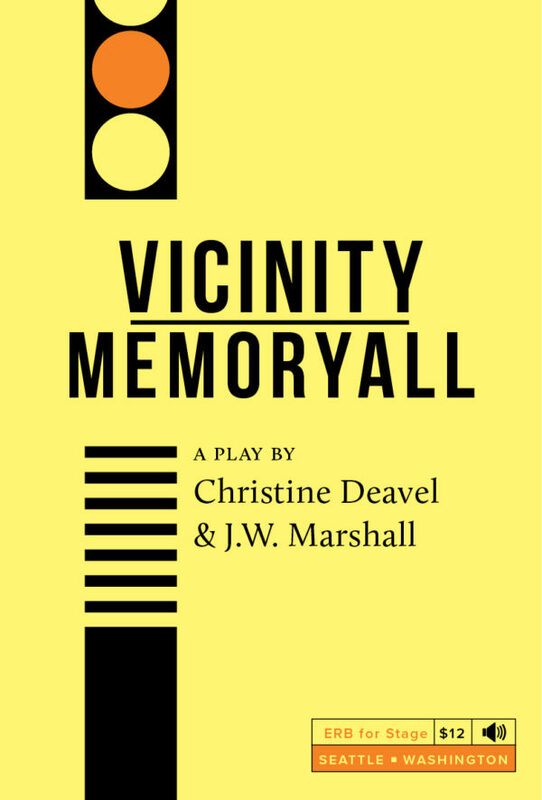 We could not be more honored that our first play also happens to be the first play written in collaboration between two well-known and well-loved Seattle poets, Christine Deavel and J.W. Marshall. Christine Deavel is the author of the poetry collection Woodnote, published by Bear Star Press, winner of the Washington State Book Award for Poetry. J.W. Marshall is author of Meaning a Cloud, winner of the Field Poetry Prize and published by Oberlin College Press. They founded Open Books, a poetry-only bookstore in Seattle, in 1995 and operated it until 2016. Produced to be used, we mimicked the Dramatists Guild format: it’s stapled, bound in durable stock, and cheap enough to get all the copies your theater might need, but with a touch more design flair and a nod to armchair reading. This book includes a digital download featuring an original song by Christine Deavel, music by R. Gary Deavel, and a film by Sarah Lintakoon. Please drop us a note for production discounts: publisher@entreriosbooks.com.